You have cruised New England every summer and know all the nooks and crannies along the coast. Maybe you have been a racer and are now feeling that it is time to take part in a more relaxed sailing environment. The Caribbean has long loomed as a dreamed-about winter destination, but how to get your yacht there? Or maybe the Mediterranean has been calling to you for years, but you do not relish the idea of a transatlantic voyage. Dockwise Yacht Transport, renowned for their semi-submersible vessels which allow yachts of any size to be easily and safely sailed on and off the yacht carrier, has been shipping yachts since 1987 and operating out of Newport, RI since 2001. More than 600 yachts are transported annually to destinations as far away as Costa Rica, Australia and New Zealand in the Pacific, Martinique and St. Thomas in the Caribbean, and Palma, Toulon, Genoa, Taranto and Marmaris in the western Mediterranean. In November, the big orange ships go from Newport to St. Thomas and Palma de Mallorca in the Med, and a return voyage is offered in May, allowing sailors to enjoy the cruising seasons in their preferred location. The pluses of shipping are many: less wear and tear on your yacht (just think of the cost of replacing a mainsail), less engine time and less travel time; after all it is a 1,500 miles ocean voyage from Newport to St. Thomas or over 3,500 miles across The Pond to the Med. It is often hard to organize a delivery crew if you own a recreational yacht, or if you are part of a paid crew, the voyage is an opportunity for a much-needed vacation. Your yacht will arrive at its destination in the same pristine condition that it was in when loaded onto the DYT yacht carrier and it will have only taken a week to the Caribbean or 15 days to the Med, compared to three to six weeks on your own keel. Prepping the yacht is easy. Basically, just stow securely below any cushions and loose items, remove your headsail and cover your mainsail and you are ready. 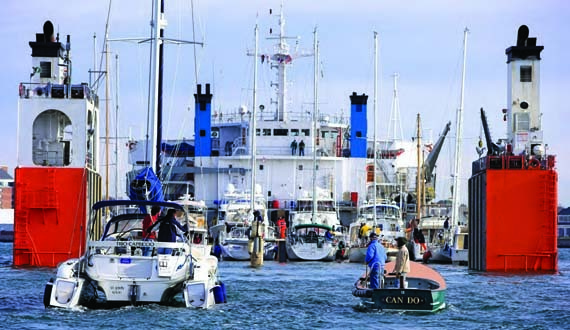 (More tips on preparing your boat for transport can be found on page 25). The loading process in Narragansett Bay is hassle-free. You will be notified about a week before loading of the exact time and place, and advised to have double bow and stern lines in place together with fenders on each side. The loading master will advise you on Channel 17 when to proceed into the ship, the DYT crew will catch your lines and you will be in place before you know it. Once final paperwork is completed in the ship’s office, you are then brought by launch back to Oldport Marine in central Newport Harbor. The same process applies for unloading, only in reverse. The DYT website, yacht-transport.com, has a wealth of information on how it all works, and our agents in each port are always happy to answer any questions that may arise. • Secure everything. No matter how far your boat is traveling, you should secure it as if it were crossing an ocean. Secure anything that could cause damage during the voyage. Secure hatches with tape to avoid leaks and possible rainwater damage, and latch all cabin windows. Also remember to tape interior cabinet doors shut, securely close the cabin doors and lock all exterior doors. • Inform DYT of the yacht’s specifications in advance. Digital docking plans need to be submitted. Make sure the measurements are accurate, because DYT is allocating space for your boat according to the provided information. We want to know your boat’s actual displacement weight – not its tonnage. • The outside of the yacht can be protected with shrink wrap. We recommend covering vulnerable areas such as teak and non-skid surfaces as well. Cover all stainless steel and chrome fittings, or apply an insulator wax to this exposed metal. • Deliver your yacht as light as possible. This includes a minimum of fuel and water in its tanks. • Power down everything, unplug the batteries and store the cables to prevent any contact. This prevents dead batteries when the yacht is offloaded at your destination. • Bring the original registry and boat keys to the attending DYT rep at the date of loading. • If shipment takes place during winter months, it is a good idea to weatherize the engine and drain the air conditioning unit. • When preparing a wooden boat for transport, it is advisable to use linseed oil to help prevent the wood from drying out. Dockwise Yacht Transport prides itself on customer service, not only with the booking process but also with helpful information on our ports of call, customs and immigration, marina facilities, etc. So, how do you book a voyage? Just call or email me in Newport at ann@dockwise-yt.com or 401-439-6377 and I will be happy to walk you through the process and send you a quote which will have two forms attached to it: a client data sheet and a yacht data sheet. They are to be returned with a copy of your yacht’s documentation and a copy of the yacht’s hull insurance coverage (the cost of insuring your yacht while it is on our ship is included in the transport price). Once these are received, I will issue your booking note or contract. Payment, either by check or wire transfer, is due within 15 days. The world is now an easier place to explore, and DYT welcomes the opportunity to speak with you about shipping your prized possession. Headquartered in Fort Lauderdale, Fl (Port Everglades is our main hub), Dockwise also has offices in Newport, Genoa and Martinique and agents in each of the ports we service. We look forward to welcoming you on board. Ann Souder is Dockwise Yacht Transport’s Sales Manager for the East Coast and Caribbean.